Part of what I want to share here are pieces of my RAW life. I have such gratitude for opportunities that enrich and inspire me and Saturday was such a moment. 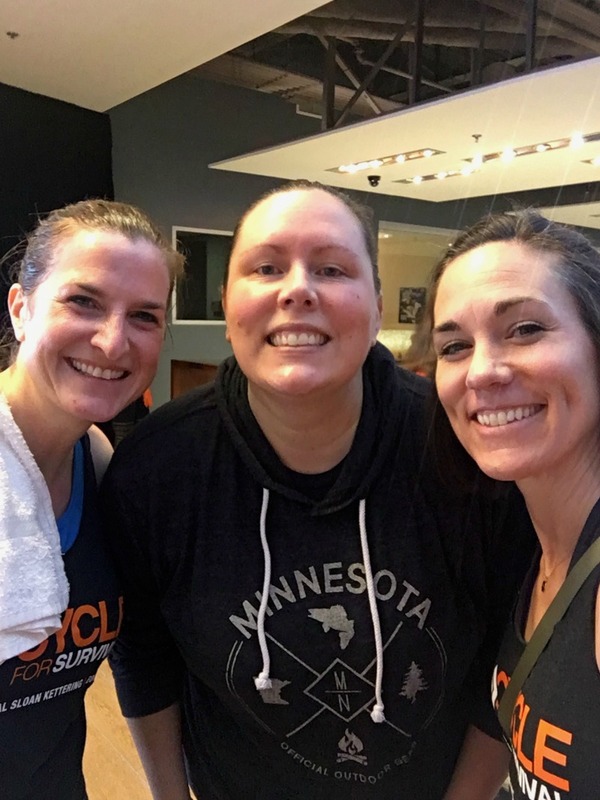 I participated in the Cycle for Survival bike ride; four hours of dance music set to a spin class, inspiring and humbling stories and plenty of celebration. The event was created to raise awareness and dollars for rare cancers and the research it takes to come up with treatments to stop them. I’m not doing it justice, but that’s the quick version. My friend Jessica asked me to join when her cousin Kelly created a team in honor of Nola, Jessica’s daughter. From my previous post, you know that Nola was diagnosed with a rare cancer at the age of two. I was honored to be asked and happy to have a way to offer support to Nola and others that have survived or lost their battle. The event took place at the Equinox gym in Dallas. The cycle room was dark except for the stage lighting (hence the low quality photos), and the music was a loud, non-stop dance party. Each team had a designated bike. One rider from the team rode every hour. In between each rider there were speakers; either survivors or family members of those with a rare cancer. I knew the day would be emotional. Not only do I have a personal connection with Nola, but the topic of cancer, in general, always has emotion attached to it. What I didn’t expect from the day was the overwhelming amount of hope and celebration. I cannot even begin to describe the energy in the room. All through my hour on the bike I vacillated between the joy of dancing and trying to keep it together. This photo is me trying really hard not to break down and cry. My friend Becky captured this and at first I was going to delete it, but then I thought better of it. While Nola’s story is not mine to tell, it doesn’t affect me any less. I have a son her age. I watched her go through it. - During the event there were times when it didn’t feel like enough. 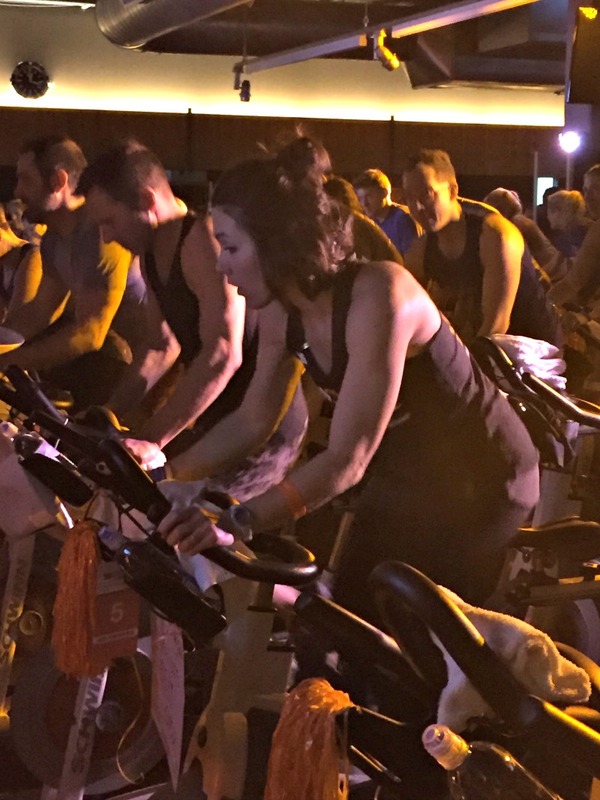 Showing up to ride a bike, raise a little money, and dance some felt too easy. But I suppose that was the point. To do something physical, raise the energy in order to raise the awareness and truly hope and celebrate. My low emotions didn’t last long. There was so much joy in the room, and everyone was vibrating so high, I quickly rematched the energy of the room. One of the best moments was when Nola came for a visit. She was so happy to see her name on the message wall and see her mom on the bike. I’m telling you, this girl is a miracle on so many levels. If anyone there was at all feeling down, all they had to do was take a look at her. I gained so much from this experience, but gratitude always comes hand in hand with others. I am thankful for Kelly’s support for Jessica and her family. He is the one that initiated the idea to put a team together. He lives in New York City and he flew to Dallas and back in one day in order to do this event. Talk about humbling! I’m grateful for my best friend Becky (the middle) who always says yes when you need her because that’s the kind of friend she is, and I’m grateful for Jessica (left) for asking me to join the fight and for allowing me to celebrate her and Kaci’s daughter, Nola. It was one of the neatest experiences of my life and I can’t wait to do it again next year! The month of gratitude has come to a close. Another year and yet it feels like the first all over again. Joy is like that: it creeps up and fills your being with love and light. You can’t help but radiate. Despite all that joy, I still worry about the world. Especially the world my son has to navigate. I fear it isn’t kind. We’ve lost a piece of our humanity and we only see ourselves standing alone or through the eyes of social media. Are we even our own? But alas, I had a moment this month that I can’t shake. A moment of hope that maybe humanity will prevail and goodness and joy will live on. If you follow me on social media you know that I visited the Lowery Freshman Center in Allen, Texas this month to take a peak at the gratitude trees the students created. This campus devotes a class period a day to making connections. A program too important for me to poorly explain, but the point being, in November, part of the curriculum was about practicing gratitude. Truth be told, I didn’t know what to expect. Thinking of my own 15 year old self, I didn’t have a lot of faith that their gratitude would venture past food or friends. Fifteen is a developmental period of defining a clear sense of self, and its safe to say that if this wasn’t their idea, they might not be totally into it. This tree represents the roots of our beginnings, the diversity of us all, and the love that conquers all. Of course they proved me wrong! Their acts of gratitude reminded me that goodness is innate in us all; it just needs to be fostered. Sure there were many leaves thankful for Casandra (a friend no doubt) or chicken, but then there were the leaves that spoke from the heart. Thoughtful and genuine. I couldn’t stop smiling. I found joy in their joy. This is the work that needs to be done! Reminding our young people that everything they are thankful for is valuable and that thanksgiving leads straight to joy. More importantly, joy is not a mere glimpse of a happier life, but rather a state of being. Maybe then the future of our world has a chance. How can I help? Joy has been elevated this month: I can feel it. I shared this poem with my two good friends last night and I want to leave it with you. My hope is that if you’ve been practicing gratitude all month long, you have not hesitated in finding your joy, for it is not made to be a crumb. Have you ever tried Shari's Berries? My sister sent them to me for my first Mother's Day and I was hooked. Since then I've sent them as thank you gifts. So I am delighted to share their free printables with you! Being the month of gratitude, you probably are thinking about all the different things you are grateful for. While you may take some time at the dinner table before you cut the turkey to say what, and who, you're grateful for, consider taking it to the next level with these thank you printables from Berries. Giving someone a gratitude card for Thanksgiving may not be traditional, but it sure is a wonderful way to show people you appreciate them. With gift tags, coffee collars, and various cards, these printables offer a ton of creative ways to show that appreciation! Plus, if you're not sure what to say, there's also a list of 85 ways to say thank you, so you have no excuse not to practice gratitude. Who are you grateful for? Tell them with one of these cute printables! THANK YOU JULISSA FOR SHARING THESE WITH ME! Will You Put Up a Gratitude Tree? November is gratitude month, and I'm really looking forward to celebrating gratitude and taking the time to slow down and step back to enjoy life a little more. I don't know about you, but the last few months have been a little hectic. Every year I designate a tree in my front yard as the gratitude tree. It's an opportunity to subtly get my community involved in giving thanks. At first, the project was about me. The first tree I put up was during a time of high stress in my family. We were going through a very emotional year full of a lot of hurt, and I was desperate to find some joy and peace. Thus the gratitude tree was born. The idea caught on and it is no longer about me. Gratitude is a social emotion and this tree has become a creative way to connect with those around me both local and from afar. I'm creating a movement and my tree is no longer enough. It's time to grow and that is where you come in. Would you be willing to create your own gratitude tree? In your yard or home, place of business, or other community gathering place. In the past few years we have had trees in schools, yoga studios, a chiropractic office and homes. There are creative and easy ideas out there if you want to bring your tree indoors. I've started a pinterest board for inspiration. container to house the tags and markers - I use an old tool box. signage letting people know they are welcome to participate - My first sign was on cardboard! It doesn't have to be fancy or creative. It's about the process. my first tree had paper tags, and a cardboard sign in an old tool box, which I still use. Put up your tree any time in the month of November. The sky is the limit! Be as simple or creative as you want. All I ask is If you are participating, please let me know. I would love to showcase your story here on the blog. Just click the button below and reach out. I'm Putting Up a Tree!